The first ever Hyperledger Hackathon took place October 1-2 in Amsterdam. More than 120 developers (20 teams) gathered for the event organized by ABN AMRO, IBM, Holland Fintech and Hyperledger. 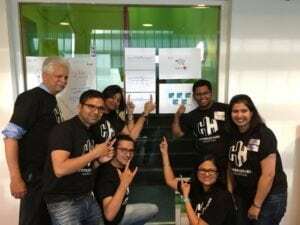 During the Hackathon, teams of students, fintechs, start-ups, and staff from IBM and ABN AMRO had 36 hours to build their own application on Hyperledger. As part of their efforts, they were allowed to tap the expertise of visiting experts from the Hyperledger Technical Steering Committee and others. At the end of the 36-hour period, a jury assessed the teams’ proposals and applications with a focus on application value to clients and business as well as its technical implementation. The energy and enthusiasm of the teams was incredible to watch. Each team had a deep appreciation of the technology and how it could be applied. A few of the teams even slept at the venue, working through the night to polish their implementation and pitch! The winning team (pictured below) built a practical application for the storage of medical information, controlled and updated by medical experts and patients as owners of the data. Each team member won an Oculus Rift. 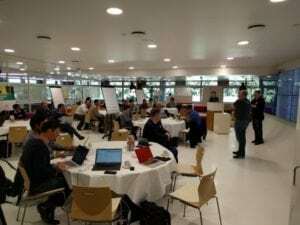 Following the Hackathon was the Hyperledger Hackfest, which took place on October 3-4 in the ABN AMRO Innovation Centre. 60 developers attended. This marked the first time the bi-monthly international Hackfest was held in Europe. If you are interested in further engaging with the technical community, sign up for one or more of the mailing lists at https://lists.hyperledger.org/mailman/listinfo.